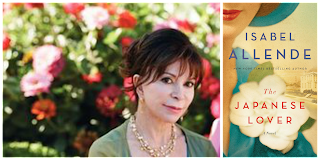 Isabel Allende has a new book out on November 3, 2015, The Japanese Lover, and it's already on listed on "Best Fall Books" everywhere. In 1939, as Poland falls under the shadow of the Nazis, young Alma Belasco’s parents send her away to live in safety with an aunt and uncle in their opulent mansion in San Francisco. There, as the rest of the world goes to war, she encounters Ichimei Fukuda, the quiet and gentle son of the family’s Japanese gardener. Unnoticed by those around them, a tender love affair begins to blossom. Following the Japanese attack on Pearl Harbor, the two are cruelly pulled apart as Ichimei and his family—like thousands of other Japanese Americans—are declared enemies and forcibly relocated to internment camps run by the United States government. Throughout their lifetimes, Alma and Ichimei reunite again and again, but theirs is a love that they are forever forced to hide from the world. Decades later, Alma is nearing the end of her long and eventful life. Irina Bazili, a care worker struggling to come to terms with her own troubled past, meets the elderly woman and her grandson, Seth, at San Francisco’s charmingly eccentric Lark House nursing home. As Irina and Seth forge a friendship, they become intrigued by a series of mysterious gifts and letters sent to Alma, eventually learning about Ichimei and this extraordinary secret passion that has endured for nearly seventy years. Sweeping through time and spanning generations and continents, The Japanese Lover explores questions of identity, abandonment, redemption, and the unknowable impact of fate on our lives. Written with the same attention to historical detail and keen understanding of her characters that Isabel Allende has been known for since her landmark first novel The House of the Spirits, The Japanese Lover is a profoundly moving tribute to the constancy of the human heart in a world of unceasing change. Born in Peru and raised in Chile, Isabel Allende is the author of eight novels, including, most recently, Zorro, Portrait in Sepia, and Daughter of Fortune. She has also written a collection of stories; three memoirs, including My Invented Country and Paula; and a trilogy of children's novels. Her books have been translated into more than twenty-seven languages and have become bestsellers across four continents. In 2004 she was inducted into the American Academy of Arts and Letters. Isabel Allende lives in California. Crimson Peak: Would you be mine? Crimson Peak is a 2015 gothic romance-horror film directed by Guillermo del Toro and written by del Toro and Matthew Robbins, out now in theaters. I am very excited to see it. Beasts of No Nation is a 2005 novel by the Nigerian-American, Harvard-educated author, Uzodinma Iweala, that takes its title from Fela Kuti's 1989 album with the same name. This year Netflix adapted it for film. A film which is so devastatingly engrossing and haunting that it will shake you to your core. It's a masterpiece of the craft and not to be missed.